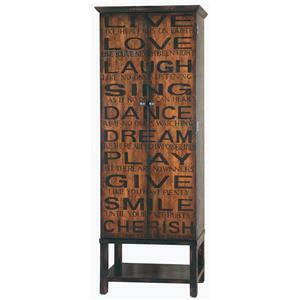 Give your home some functional storage and intricate styling with this beautiful Finesse accent console. The piece features two mirrored doors with wood grilles that are a little reminiscent of dragon designs. Open these doors to reveal a stemware rack, adjustable shelf, and an adjustable shelf that reverses to a bottle rack. The Accents Finesse Accent Console with Wine Storage by Pulaski Furniture at Godby Home Furnishings in the Noblesville, Carmel, Avon, Indianapolis, Indiana area. Product availability may vary. Contact us for the most current availability on this product. Explore the beauty and elegance of this Home Accents collection. From accent chests, stools and tables, to pedestals and plant stands to bath vanities and bookcases, you will find the perfect accent to decorate your home. These accents provide just the right finishing touch for any room in your home. Discover the pieces that will so wonderfully reflect your unique sense of style. All of these items are made with high quality craftsmanship and delicate hand-painted detailing. The Home Accents collection translates elements from history into a lavish collection to to add beauty, enjoyment and value to your home. 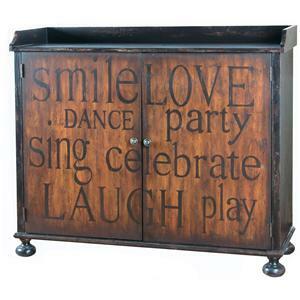 The Accents collection is a great option if you are looking for furniture in the Noblesville, Carmel, Avon, Indianapolis, Indiana area. Browse other items in the Accents collection from Godby Home Furnishings in the Noblesville, Carmel, Avon, Indianapolis, Indiana area.